The Aztec image of Coatlicue - She of the Serpent Skirt - is a powerful and brutally direct expression of the indestructable nature of life. Having been made pregnant by a ball of feathers, Coatlicue became the Mexican Virgin Mother of Huitzilopochtli, one of two principal deities in the Aztec pantheon. However, her eldest daughter Coyolxauhqui was angered by this 'shameful' pregnancy and raised an army of her brothers and sisters to kill Coatlicue. At the very moment of Huitzilopochtli's birth, Coyolxauhqui decapitated her, and as she did so, snakes emerged from her bleeding neck to keep her alive. Huitzilopochlti leapt out from the womb in full armour and killed Coyolxauhqui, tossing her body down the mountain upon which he had been born (and thus providing the sacred precedent for the practice of the bodies of sacrificial victims being thrown down the steps of the temple). It is said that Huitzlipochlti placed Coyolxauhqui's head in the sky so that his mother could always gaze upon the face of her eldest daughter, a detail from the myth that demonstrates that Coatlicue survived the attack, and underscores the indestructability of life that the story discloses. Seen here then, in a graphic but authentically Aztec expression of this mythical episode, in the centre is Coatlicue in the throes of labour as Huitzilopochtli emerges from her. 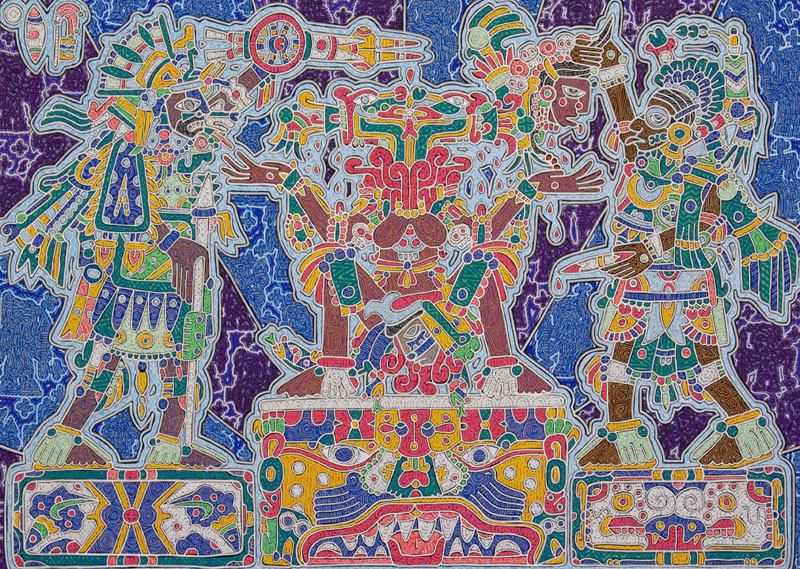 Coyolxauhqui on the right in full battle dress bears the obsidian knife with which she has decapitated Coatlicue, and her lifeless head is held above the snakes springing from her neck. At left, Quetzalcoatl wearing the mask of Ehecatl - god of the winds - bears Huitzilopochtli's shield and spear, ready to hand them over the moment his birth is completed. Coatlicue stands upon a stylised platform bearing the face of Xolotl, the Earth Monster, and in the background, the stars coalesce into warriors - these are Coyolxauhqui's brothers and sisters scattered as the stars.